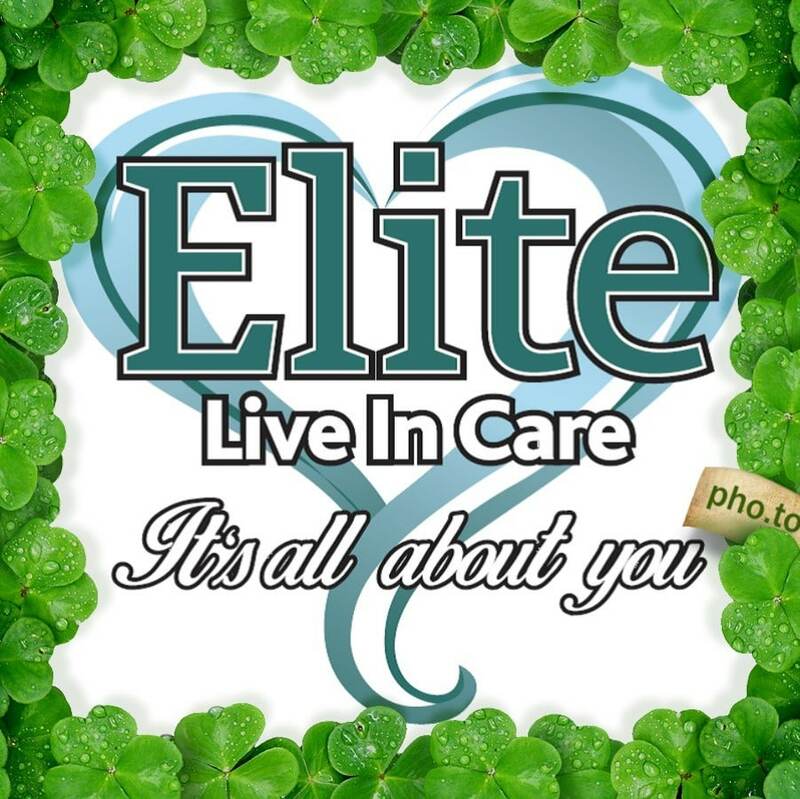 Elite Live In Care Limited would like to wish you all a very happy St Patrick’s Day. Should we really be berating our doctors nurses and paramedics for not hitting their targets. I don’t think so. Having been an intensive care nurse in the past, I’ve taken handover many times from paramedics ranging for 10 to 45 minutes. It’s crucial to get a good handover, it’s a life saver. Maybe it’s not so difficult to see the problem, the emergency services are simply underfunded, resulting in understaffing. Image caption The QA Hospital was criticised last month when a third of Hampshire’s on-duty ambulances were queuing outside at one time. The time taken to off-load emergency patients from ambulances at a Portsmouth hospital has exceeded an hour more than 1,300 times in 10 months, figures show. Handover times at the Queen Alexandra Hospital (QA) failed to meet targets on 11,620 occasions, the BBC found. The hospital was criticised last month when a third of Hampshire’s on-duty ambulances were queuing outside. The ambulance service said transfer times were a “top priority”. The QA’s emergency department was described as “severely overcrowded” in a Care Quality Commission (CQC) report in June, and in October the trust’s chief executive raised concerns about the hospital’s high occupancy rate. Government guidelines state patients should be handed over from the care of ambulance crews to hospital staff in under 15 minutes. Figures for hospitals in the south in England, obtained under the Freedom of Information Act, showed the transfer process at the QA took more than an hour 1,340 times between January and November 2015. The total at Southampton General Hospital, comparable in size to the QA, was 111. 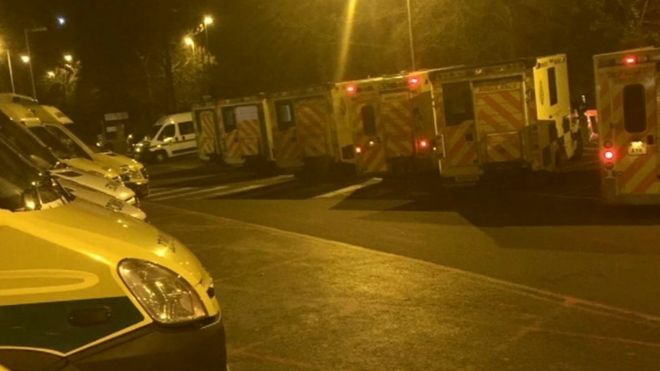 On 21 February, paramedics and patients complained about ambulances being held the QA car park for up to seven hours. At one point a third of Hampshire’s on-duty fleet of 46 ambulances were stacked at the hospital. Portsmouth Hospitals NHS Trust later apologised for treating patients in ambulances and blamed the situation on the emergency department being “exceptionally busy”. Mark Ainsworth, Director of Operations at South Central Ambulance Service (SCAS), said: “We work in partnership with all hospitals to ensure that we are able to effectively hand our patients into the care of the hospital and response to the next patient who may require our help. The figures also show 60% of handovers at Poole Hospital took more than 15 minutes. Both Poole and the Royal Bournemouth Hospital have seen an increase in handover times, year-on-year. The South Western Ambulance Service Trust said it was working to minimise delays. “On average, more than 55% of our patients are treated via other, more appropriate, care pathways at home or within the community, either face-to-face or over the phone, without needing to attend an emergency department,” a spokeswoman said. Mark Mould, Poole Hospital’s chief operating officer, said it was experiencing “sustained and exceptional demand” and added that “new procedures” had been introduced to try and improve patient handovers. “We would encourage people to use the ambulance service only when it is really an emergency. We know our ambulance colleagues are facing considerable pressures and it is vital that such an important resource is used appropriately so it is available for those who truly need it,” he added. A spokesman for Portsmouth Hospitals NHS Trust said: “We have been experiencing an extremely high demand on our emergency department, with huge numbers of very sick, frail and elderly patients requiring emergency care. “These increased elderly admissions, and the acuity of patients who are coming through our doors, does impact on our ability to accommodate, in a timely fashion, all ambulance arrivals. Ten NHS-supported ‘healthy new towns’ have been announced, designing cycling into them from ground up. Tackling physical inactivity is one of the aims of the towns, which include sites in Bicester, Hampshire, Kent, Runcorn and Darlington, among others. NHS chief Simon Stevens said “we’ll kick ourselves” if the opportunity to make physical activity more attractive is missed. Guidelines for the towns include “delivering radically improved infrastructure for safe active travel”, tackling unhealthy and obesogenic environments, making the most of opportunities to encourage physical activity and “the use of behavioural nudges to encourage healthy behaviours”. Why now? It’s not news that physical inactivity is costing the nation dearly, but the statistics cited by the NHS are eye-watering and prove once again that failing to take action would be disastrous. NHS chief executive Simon Stevens said: “The much-needed push to kick start affordable housing across England creates a golden opportunity for the NHS to help promote health and keep people independent. As these new neighbourhoods and towns are built, we’ll kick ourselves if in ten years time we look back having missed the opportunity to ‘design out’ the obesogenic environment, and ‘design in’ health and wellbeing. Professor Kevin Fenton, National Director for Health and Wellbeing at Public Health England, said:“Some of the UK’s most pressing health challenges – such as obesity, mental health issues, physical inactivity and the needs of an ageing population – can all be influenced by the quality of our built and natural environment. The considerate design of spaces and places is critical to promote good health. This innovative programme will inform our thinking and planning of everyday environments to improve health for generations to come. 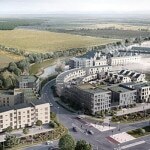 NHS to create 10 new healthy towns – is one being built near you? THE NHS is creating 10 ‘healthy towns’ providing 76,000 new homes in a bid to fight Britain’s obesity crisis. The new communities in England will be used to test ideas for reducing obesity, including having fast-food free zones near schools and green spaces. NHS England said the developments will be focused on “healthy living” and will provide more than 76,000 homes across England. The communities will also provide care and support for dementia sufferers. Clinicians, designers and technology experts will work together to create the new healthy towns. The money to build the developments will come from council budgets and private partners rather than from the NHS. The places earmarked to test the healthy living scheme include existing villages in the South West, London and the North West and two new developments in Cambridgeshire and Darlington. Some developments are already being built, while others will not be completed until 2030. One of the developments in northwest Bicester, Oxfordshire, will have 6,000 zero-carbon homes and cycle networks to promote exercise. Ebbsfleet Garden City in Kent will provide up to 15,000 homes in the first garden city for 100 years, while Cranbrook, Devon, will have 8,000 homes with healthy lifestyles taught to pupils in schools. A community with more than 3,000 homes in Whitehill and Bordon, Hampshire, will be “care ready” to help people who have long-term conditions. Simon Stevens, the head of NHS England, said: “The much-needed push to kick-start affordable housing across England creates a golden opportunity for the NHS to help promote health and keep people independent. “As these new neighborhoods and towns are built, we’ll kick ourselves if in ten years time we look back having missed the opportunity to ‘design out’ the obesogenic environment, and ‘design in’ health and wellbeing. Professor Kevin Fenton, national director for health and wellbeing at Public Health England, said: “Some of the UK’s most pressing health challenges – such as obesity, mental health issues, physical inactivity and the needs of an ageing population – can all be influenced by the quality of our built and natural environment. A brand new college is set to launch in an attempt to improve people’s health. Based in Farnham and North East Hampshire, the Recovery College aims to help people manage their symptoms. The college will tackle both mental and physical health issues. Teaching will come in the form of both courses and workshops and is targeting both those suffering, carers, and health professionals. “The Recovery College aims to help people feel in control of their symptoms, rather than symptoms controlling them. The College is part of the ‘Happy, Healthy, at home’ programme which combines the health and social care services with the voluntary agencies in the area. This College, if successful, will be reported back to the NHS and may be rolled out nationally. Dr Devon continued, “They [the courses] take place in community locations such as libraries or colleges, and people can register for courses themselves – they don’t need their GP to refer them. “The courses are delivered in a supportive environment. “Many courses are written and taught by people with lived experience of physical and mental health difficulties alongside professionals. You must be 18-or-over to enroll on one of the Recovery College courses or workshops. You can find out more information on the Recovery College website. 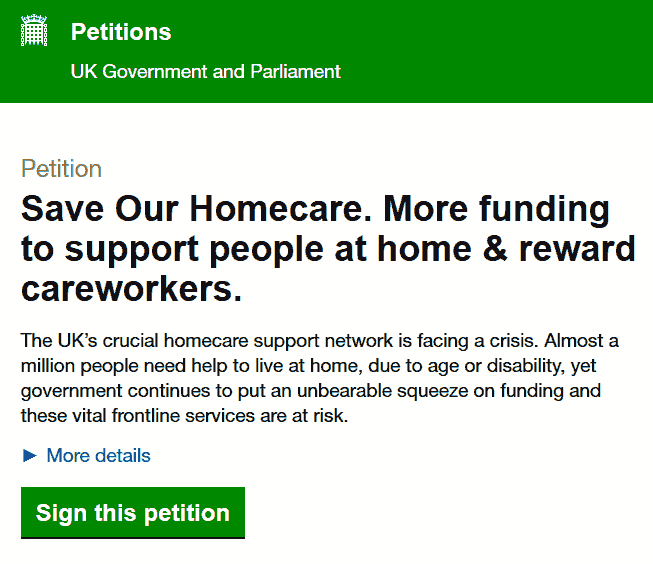 UKHCA’s Save Our Homecare e-petition has to date generated approximately 22,000 signatures, however it needs a lot more in order to demonstrate to Government the urgent need to protect homecare services – both for today and the future. How many people work in your office? How many people are in your care team? How many friends do you have on social media? If every UKHCA member got 35 or more people to sign the petition, then we would easily have the 100,000 signatures needed to get the petition considered for debate in parliament. You can play your part by encouraging your colleagues, clients and wider community to get involved and sign the petition now. You will receive an email from the Parliament petition site – this is in order that they can be sure that you wanted to sign the petition. Please note: Some email providers will send this email into the junk / spam folder. So, please do check there if it doesn’t come through as expected. For more information on the campaign, or to download resources to help you promote it, please visit the Save Our Homecare web page. Typical care home fees for elderly people surged by an average of £900 last year alone – and more than twice that for those needing more intensive nursing, new research has disclosed. Meanwhile as many as 22,000 older people receiving residential care in England – or almost one in 10 – were given just a week’s notice before seeing hefty increases on their bills, it found. Most of the others were given less than a month to adjust to significant increases in their care bills, the investigation by the charity Citizens Advice concluded. The findings came as separate research by Good care Guide pointed to “dire” standards in care provided to older people in their own homes. Citizens Advice carried out a mystery shopping exercise on just over 400 care homes. Eight per cent of the homes told researchers that they only give a week’s notice to residents that prices are set to increase. That suggests that around 22,000 older people and their families were given days to adjust to the rises. The charity say this is not enough time for vulnerable elderly people to be prepared for the upheaval of moving to a cheaper home. Separate analysis by the consumer charity found that average costs had risen steeply. In the east of England costs had risen by an average of £2,000. • How can I stop the council forcing my mother to use her house to pay for care? The charity is calling for a minimum amount of notice care homes must give to residents before imposing price rises. It is calling for a minimum amount of notice care homes must give to residents before imposing price rises. The research found that average annual fees for nursing care in England leapt by £1,872 to £40,248 in the financial year 2014 to 2015. Bills for less intensive residential home care rose by £572 to reach £29,588 over the same period. The average rise, taking account of the different levels of care, was around £900. “People in care homes are at the mercy of price rises,” said Gillian Guy, chief executive of Citizens Advice. “A week’s notice puts enormous pressure on care home residents or their families to pay. “It is unreasonable for vulnerable people to face such a small window to compare costs and make alternative arrangements if they cannot afford the higher fees.” Under the current system Local authorities will pay the whole care bill if the resident has less than £14,250 and will help pay if they have savings and assets of less than £23,250. However, residents who have more than that must pay the entire cost themselves. Fees can also vary widely depending on the home and location. Families are often forced to sell homes and assets to pay for care if they do not qualify for local authority help. A Conservative manifesto promise originally meant to come into force this year to introduce a lifetime cap of £72,000 on the amount people should spend on care has been postponed until at least 2020 after council leaders asked for the funding to be spent elsewhere. The research also found that many homes do not include the price of basic services such as visits to a GP or use of a telephone in their weekly fees. Ms Guy added: “Some people are also being caught out by hidden extra care fees appearing on their bill. “Nobody can be expected to budget for extra costs that are not clearly set out by the provider. “There should be a minimum amount of time care homes can give notice of a price rise and the Competition and Markets Authority should look into whether the care home market is working well for people paying for its services. We value every single person who works with us and is cared for by us. We believe we are all part of the same team and that’s why we are Elite. Another 5 Star Review For Elite Live In Care. Review: I find my carer absolutely fabulous. I am treated extremely well. When my assessment was completed I was asked all the important questions so I can be cared for well. Having a carer here all the time makes me feel good and safe. 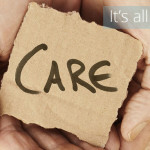 The Elite Live In Care Team would like to thank all of our fantastic carers for their excellent service to our clients. 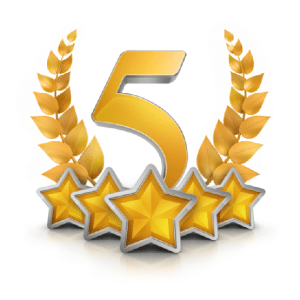 We would also like to thank our cherished clients for reviewing our service.